Pressure gauge syphons per DIN 16282 U-form, form B, and trumpet form, form D, have a welding connection for the pressure tapping on the process side and a threaded connection on the instrument side. In the industrial standard versions, threaded connections are also available for the pressure tapping on the process side. 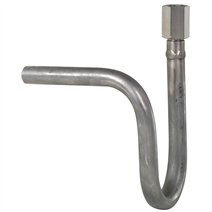 U-form pressure gauge syphons are intended for horizontal pressure tapping; trumpet-form pressure gauge syphons are intended for vertical pressure tapping. Inside the pressure gauge syphon, condensate is collected, which prevents the ingress of hot media into the measuring instrument. We recommend filling the syphon with a cooling separating liquid before commissioning the pressure line.